Next Saturday, 15th is the release day at Birdie Brown! 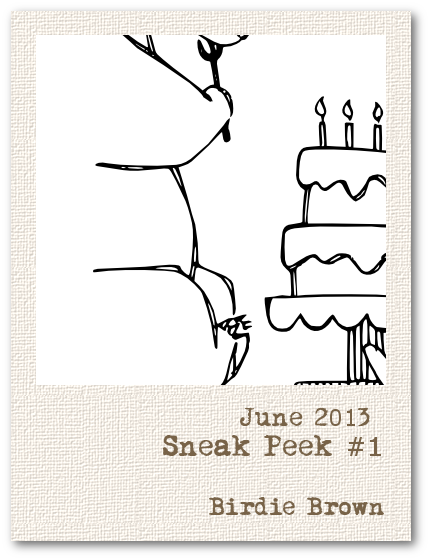 This month, all of the new images were hand drawn. And I hope you can 'bear' with me... because I will release a couple of bear images again! LOL!! The big bear is having a birthday party with his little friend. Do you think he can wait to bite the cake until they finish singing "Happy Birthday to You"? I think he's thinking that it's too small to share! Love this already Torico! I have a favorite children's book that I used to read to my kids called You and Me Little Bear and the sneak peeks of this bear are bringing back memories of those bedtime moments. Thanks for that! I mean to say, "Yay! I made it to the sneak peeks... I almost missed them. ", blushing in embarrassment.